Whether it's beef, bison, or cauliflower steaks, treat it like royalty with the Wusthof Stainless Steel 10 Piece Steak and Carving Set with Presentation Chest. This collection is a beauty to behold and a joy to use. 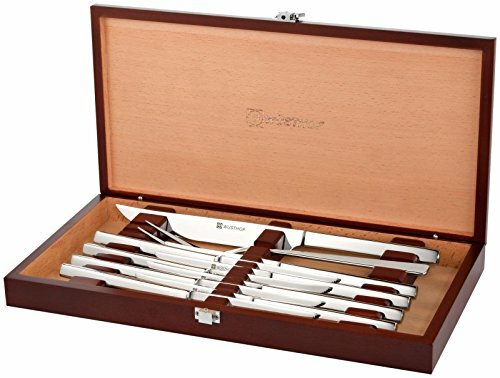 It includes eight stainless steel, serrated edge steak knives, a two-piece carving set, and a stunning wood presentation case with rosewood stain. The blades are sharp, the handles polished to a high sheen, and this would make a fantastic wedding gift. About Wusthof Since their humble beginnings in 1814, the Wusthof family business has adhered to the same basic set of principles regarding their products. Their Trident logo is a representation of these principles, a symbol of form, function, and uncompromising quality. Today, Wusthof stands firm behind a strong line of products, including an assortment of more than 350 forged knives, as well as cutting boards, knife blocks, kitchen tools, and scissors, all of which are produced by dedicated workers at state-of-the-art facilities in Solingen, Germany. High carbon 18/10 stainless steel. Polished 18/10 stainless steel handles. Includes wooden case with rosewood stain. Dishwasher safe. Set includes 8 steak knifes, 2-pc. carving set, wood case.